Keep your valuable safe & clean! 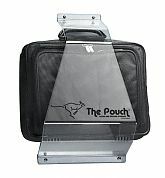 "The Pouch" Clean & Secure Storage keeps personal items off unsanitary floors and puts an end to restroom and fitting room theft. 3/16" Thick Clear Acrylic with Fasteners. 20" High, 12" Wide at the Bottom, 6" Deep. Please call or use our Online form to receive an RGA (Return Goods Authorization) number within 30 days of purchase prior to returning merchandise, returns WILL NOT be accepted without one. No restocking fee on items listed online. Defective products will be replaced.